Scoop, beat, pour, and mix—then knead, fold, knead, fold. It’s the methodical way that you’d make a dough for challah, and the process itself seems quite mechanical, if you were doing it alone in your own kitchen. But making challah with 20 people in someone’s home is quite a different experience, and creating challah with people who are doing it for the first time is exhilarating. I participated in the event as a member of the Advisory Council of InterfaithFamily (IFF-Philadelphia) and it attracted a demographic that would be the envy of any Jewish outreach movement. Four young millennial-aged couples attended, with a smattering of some young singles, older folks, and a mom with her two kids – their common interest was in ‘doing Jewish’. 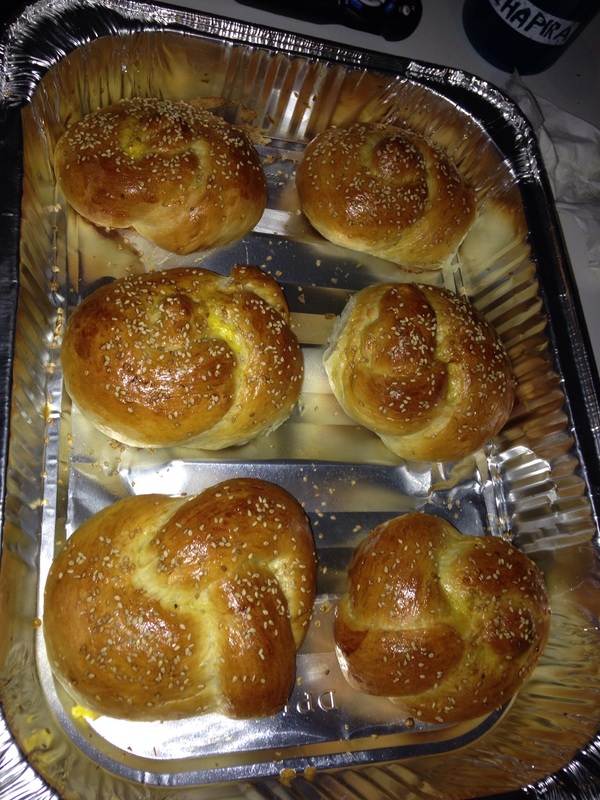 That was the foundation upon which people built connections and shared Shabbat stories along with flour and measuring cups that were set aside at stations, like in some amazing challah bake-off on a Jewish Food Network show. The event was called “Challah and Conversation” and by the end of the night, there was plenty of both. The environment was open, accepting and casual which allowed participants to feel comfortable asking about the many beautiful and significant rituals surrounding Shabbat. There was curiosity about egg-checking (for kosher reasons), traditions for candle-lighting, the custom some choose to follow for ‘taking challah‘, and questions like: Why do some people tear the challah and not slice it with a knife? Why is salt sprinkled on it? Why is the challah covered? What is the ‘Parent’s Prayer’? The most outstanding experience from the evening was not the beautifully braided specimens in personal aluminum baking dishes that everyone was taking home, ready to be baked. Nor was it that everyone would get to savor the experience all over again when that unmistakable luscious challah smell would fill their homes before the Sabbath began. What was undeniably special was that people came together, in the true spirit of learning and community, and shared an experience that brought them that much closer to Judaism, and that much closer to each other. This entry was posted on Wednesday, August 5th, 2015 at 1:13 PM	and tagged with Challah, Interfaith, InterfaithFamily, Judaism, Outreach, Sabbath and posted in Jewish Holidays, Judaism, Outreach, Religion, Sabbath. You can follow any responses to this entry through the RSS 2.0 feed.